If the buttermilk pancakes I made last week were too tame for you, try these tropical banana pancakes with macadamia nut sauce instead. 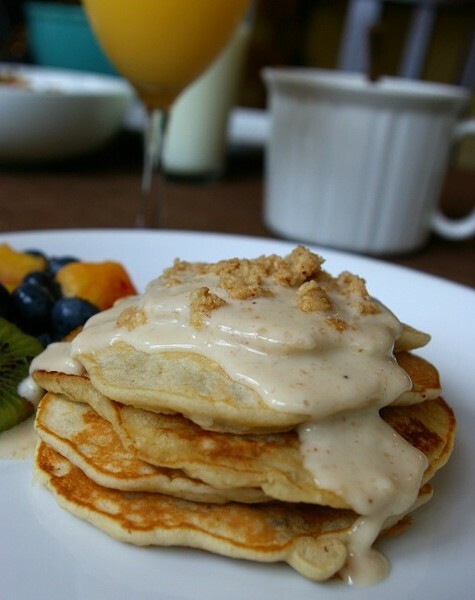 Banana pancakes, made by adding two mashed bananas to pancake batter, are a fun twist to plain pancakes. Topped with a creamy toasted macadamia nut sauce and sprinkled with ground macadamia nuts, these are definitely a good reason to get out of bed in the morning. Similar pancakes are served up at Boots and Kimo's Homestyle Kitchen in Kailua, HI, and are quite a hit. Since Hawaii might be a tad far to travel for breakfast, here's the recipe. You can make the sauce ahead of time, and just warm it in the microwave before serving. Grind macadamia nuts in a food processor until fine. Place nuts into a medium saucepan and fry over medium high heat for 5 min or until fragrant. Remove from pan, and set aside. Lower heat to medium and add the butter, stirring until melted. Stir in flour and cook 1 min. Slowly pour in milk and cream, constantly whisking the whole time. Add sugar, salt, vanilla to the pan. Cook 5 min or until thickened, stirring constantly. Stir in lemon juice and half of the ground macadamias. Pour sauce into a serving dish. Serve warm and sprinkle remaining ground macadamia nuts on top of each serving.